When my daughters came home this week with a pumpkin fundraiser from their school, I immediately ordered seven pumpkins. At first my family thought I was crazy (and who's to say I'm not), but I had the best pumpkin day with my students last year and I can't wait to do it again this year. For our fun pumpkin day, I put the students in groups of 3, and gave each group a pumpkin. The rest of the day was dedicated to pumpkin activities. The first activity was a science activity in which the students had to make a hypothesis as to whether their pumpkins would sink or float. After they tested their hypothesis, it was time to hollow out the pumpkins and begin to count the seeds. There were two graphing activities (scatterplots) related to counting the seeds - one compared the number of seeds to the circumference of the pumpkin, and the other compared the number of seeds to the number of vertical lines on a pumpkin. The students had to determine if there was a correlation between the two. Then the students worked with figurative language, coming up with similes and metaphors for their pumpkin (we worked with our kindergarten reading buddies for this activity). There was a math problem solving activity (which I am including as a freebie, as it doesn't require the pumpkin). Lastly, we made pumpkin seed mosaic pictures. Wish I had a picture of these - they turned out fantastic! Alas, this was done before my blogging days ... now I take pictures of everything. The students had a great day, I had a great day, and even my husband appreciated the day, as I brought him home hollowed out pumpkins to carve and eliminated a very messy job for him. 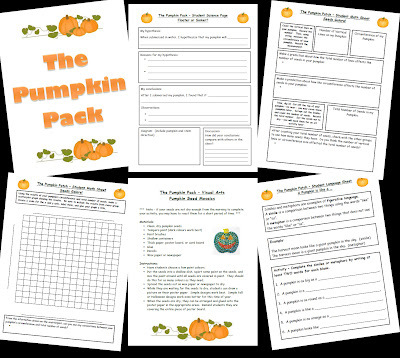 You can check out my full Pumpkin Pack Activity Day by clicking on the picture below. It includes all the handouts you will need for the day (14 pages in total for only $3.00). I also want to share a freebie from this activity with you. 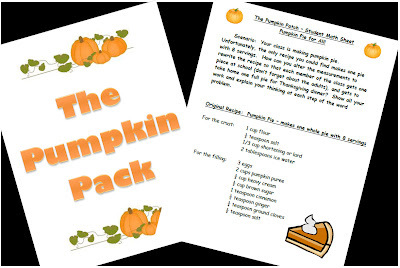 My Pumpkin Pack: Pumpkin Pie for All activity is a fun problem-solving activity where students have to alter the recipe for a pumpkin pie to make enough for the whole class to share. Click on the picture below to download your free copy. Happy Friday! YAY for weekends! That is fun! I've done a pumpkin day every year for the last few years too! But now I'm down in 2nd grade...I'll have to reconfigure everything I do...but we're still going to have lots of fun with it! Loving your fall leaves on your blog! Thanks for sharing your pumpkin activities.. I love finding different things to teach with pumpkins..
Pumpkin day is one of my favorites all year! I teach kinder and so my activities are a lot more basic. Our favorites are by far sink or float and the pumpkin life cycle bracelet. Enjoy your ay!